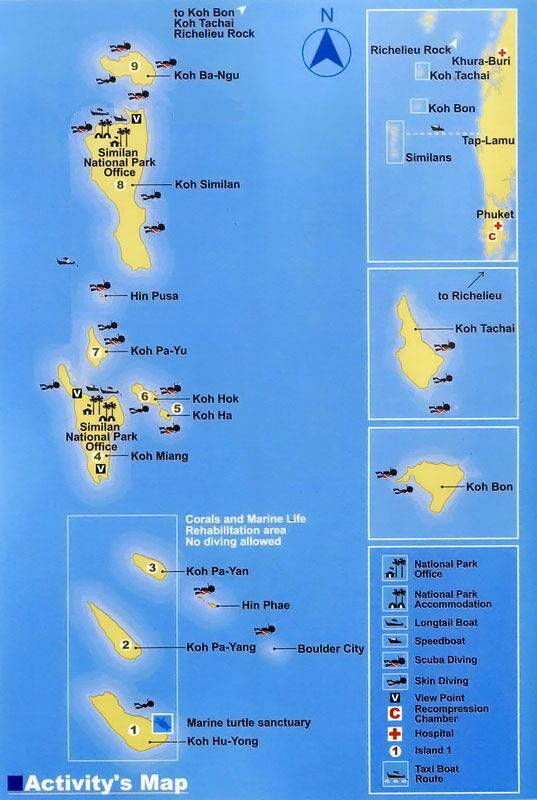 Scuba Diving Phuket – Twin Somboon Liveaboard boats are the only vessels in Similan Islands that offer the flexibility to fit almost any holiday schedule you can come up with. Somboon Liveaboard boats stay around the Similan Islands for the season, unlike other boats that travel from and to Phuket on fixed schedules. We transfer new guests to the boats by minibus and speedboat every day of the week. 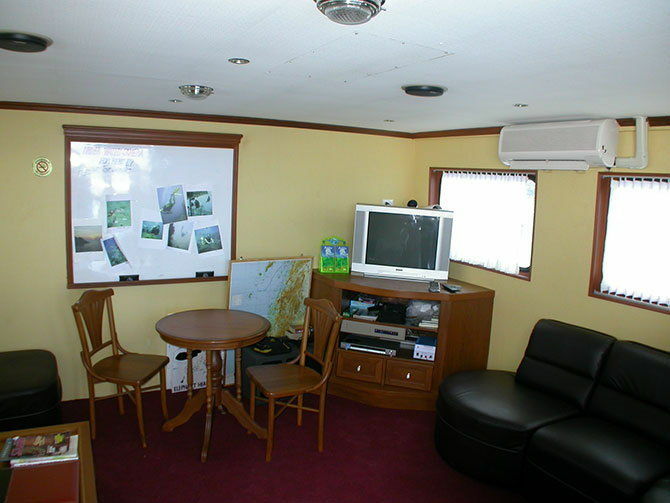 MV Somboon 3 offers divers the flexibility that other liveaboards can’t match. The boat stays in the Similan Islands all season and divers are transferred by speedboat to and from it daily. So you can depart to the Similans any day that you like and stay as few or as many nights as you like. Somboon 3 moves Mondays and Thursdays up to Surin island and Richelieu Rock for the day. She is stationed in the Similan islands every day except Wednesdays and Sundays when it moves to Koh Bon for a minimum of two of the dives on each of those days. MV Somboon 4 is economic but comfortable Liveaboard boat in the Similans, Koh Bon, Koh Tachai and Richelieu Rock. She is stationed in the Similan islands or Koh Bon every day except Wednesdays and Sundays when it moves further north to the dive sites of Koh Tachai and Richelieu Rock. Because of this you can join and depart Somboon 4 any day except for Wednesday or Sunday. Let us know how long you would like to stay on Somboon Liveaboard boat when you book. 1 day, 2 days… 10 days+… up to you! You can also extend your stay if you want; just check with the tour-leader if we still have space available. On the last day of your Liveaboard trip we transfer you back to Phuket again by speedboat and minibus. To book your Somboon Liveaboard trip, we need 50% deposit for an early booking if more than 90 days before the trip departure and the balance to be paid 90 days before the trip departure. As soon as you confirm us the booking, you will receive an invoice from PayPal that you can pay through your PayPal account or by credit cards. Park fees are payable cash at your arrival on the boat. Cabins are simply decorated, but clean and comfortable with a good value for money. All cabins are equipped with 220V and air-condition. The maximum guests is 28. All meals on board are served buffet style freshly cooked from the on board kitchen. Snacks and fruits are served in between dives. Bathrooms/toilets are shared with 6 bathrooms in total spread around the liveaboard each with soap and shampoo dispensers. Note that towels are not provided on board so please bring your own. On the upper deck there is a large covered seating area where lunch is served. Even with a full boat there is plenty of room for everyone to sit and relax either during meal times or in between dives. Snacks and soft drinks (free of charge) as well as tea, coffee and water are available throughout the day. Just serve yourself. 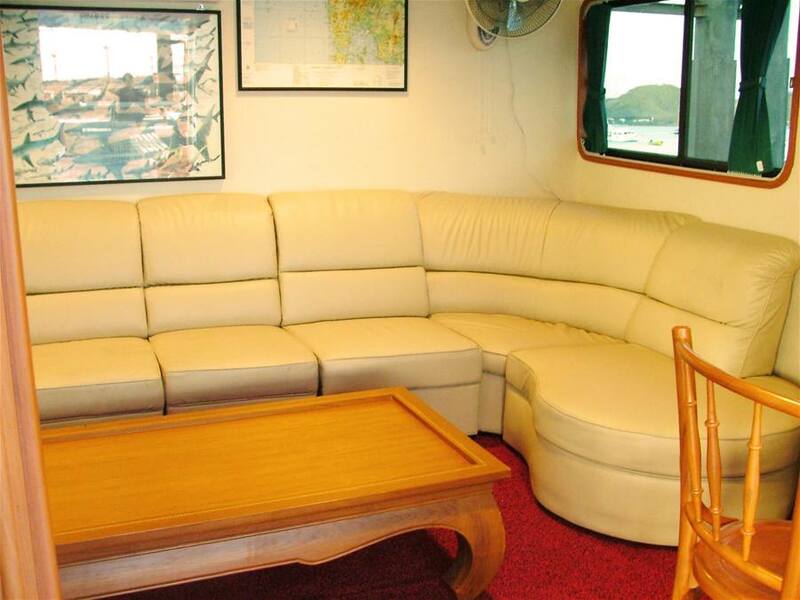 There is also an air-conditioned lounge area on the upper deck with TV and DVD player. In here you can not only find a large DVD collection but also a number of reef guides to help you identify those wonderful fishes seen on the dives. The top deck is a large sun deck with a number of sun beds and mattresses. This is a great place for the sun worshipers or to gaze at the stars in the night.